Thanks to augmented glasses, the U.S. Marines on Thursday were able to turn a golf course in Virginia into a simulated battlefield, complete with tanks, mortar fire and smoke. The simulation was a major step in the Marines' efforts to enable soldiers to regularly use augmented reality wearables to enhance their battlefield training. "The glasses are leading-edge and are really pushing the technology of optical see-throughs forward," said Peter Squire, a program officer with the Office of Naval Research. "But the glasses are just one component of the system. [We are] enabling warfighters to turn any environment into a training ground." The augmented glasses the Marines used this week were made by SA Photonics, a Los Gatos, Calif.-based company that focuses on vision systems, laser communications and satellite sensors. The augmented reality glasses superimpose images of a battlefield situation onto the live environment. That allows soldiers and their leaders to practice working in a battle situation in a safe and local area. It also saves the military the expense of setting up a fake battlefield with buildings, tanks and enemy fighters. The system, which can offer a variety of training scenarios, is "only limited by the imaginations of those using it," said Squire, who works in the military's Expeditionary Maneuver Warfare and Combating Terrorism Department. The SA Photonics glasses were only recently completed, so this was the first week the Marines were able to test them. They have not yet reported on how well the simulation worked. "For Marines, this system increases their situational awareness, whether for training or operations, giving them a wider aperture for information to help make better decisions," Nolan said. "And, in the end, that's what we're trying to do here in HPT&E: Give warfighters enough information to make the best decision possible, but not overwhelm them with so much information that they can't make sense of it." This is a great idea for not only the military but for search-and-rescue organizations, the military and first responders, said Ezra Gottheil, an analyst with Technology Business Research. "This makes sense, integrating the real and the virtual," he added. "You could use it in all kinds of training situations." Augmented reality technology has hit its stride and we're about to see its use in a lot of industries, said Zeus Kerravala, an analyst with ZK Research. "We will continue to see the improved quality of these products," he added. "It can help people improve reaction times. While you can't actually use a real battle to practice in, the reality glasses are the next best thing." 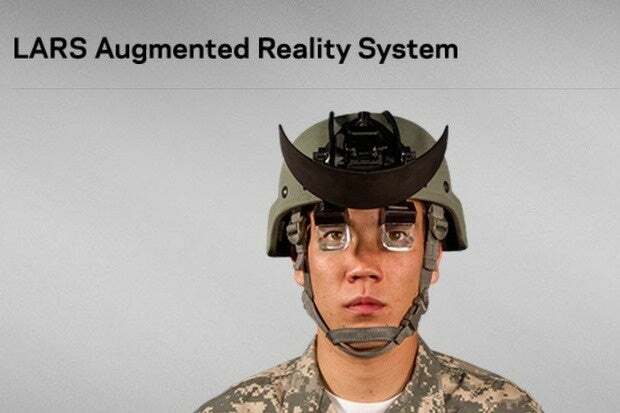 The military is in good company when it comes to trying out augmented reality glasses. In March, NASA announced that it is testing smart glasses that could help astronauts as they travel to an asteroid or Mars. The virtual reality, or augmented reality, glasses are built by San Francisco-based Osterhout Design Group and are using NASA-built applications and software.